Photography Project Evaluation. Theme of &quot;Journey&quot; with inspiration from published photographers. 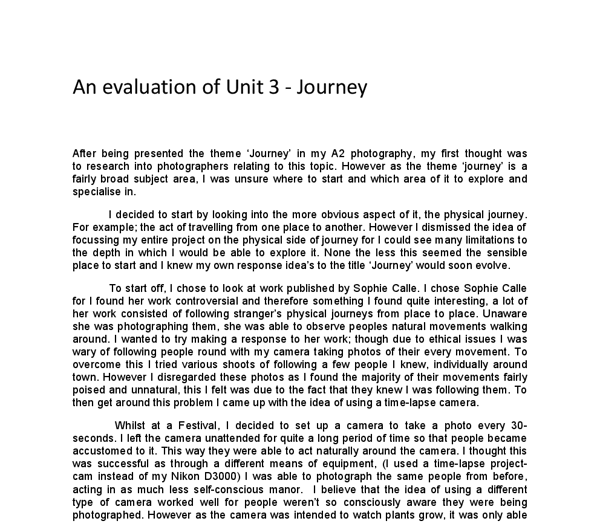 ﻿An evaluation of Unit 3 - Journey After being presented the theme ?Journey? in my A2 photography, my first thought was to research into photographers relating to this topic. However as the theme ?journey? is a fairly broad subject area, I was unsure where to start and which area of it to explore and specialise in. I decided to start by looking into the more obvious aspect of it, the physical journey. For example; the act of travelling from one place to another. However I dismissed the idea of focussing my entire project on the physical side of journey for I could see many limitations to the depth in which I would be able to explore it. None the less this seemed the sensible place to start and I knew my own response idea?s to the title ?Journey? would soon evolve. To start off, I chose to look at work published by Sophie Calle. I chose Sophie Calle for I found her work controversial and therefore something I found quite interesting, a lot of her work consisted of following stranger?s physical journeys from place to place. Unaware she was photographing them, she was able to observe peoples natural movements walking around. I wanted to try making a response to her work; though due to ethical issues I was wary of following people round with my camera taking photos of their every movement. To overcome this I tried various shoots of following a few people I knew, individually around town. However I disregarded these photos as I found the majority of their movements fairly poised and unnatural, this I felt was due to the fact that they knew I was following them. To then get around this problem I came up with the idea of using a time-lapse camera. Whilst at a Festival, I decided to set up a camera to take a photo every 30-seconds. ...read more. In my initial research stage I looked at a wide variety of artists, though I narrowed it down to a small selection that I felt would best influence my work. In the end I took inspiration from a combination of three photographers. It was only after looking at Alexander Rodchenko and Cindy Sherman?s work that I was entirely confident in which direction to head my project in. Cindy Sherman is most famous for her ?Untitled film stills? collection. This was where she modelled, directed and photographed a series of images to explore the various stereotypes of woman during the 20th century. Cindy Sherman creates a different narrative in each of her photographs to make each shot look as if it is a still image taken from a different film. 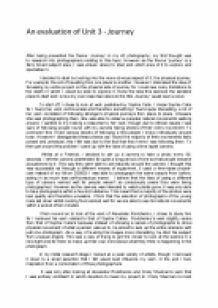 The idea of this is to expose what people assume is happening in the photographs and thus along with Alexander Rodchenko, looking at the concept of perception. It was this idea of narrative and perception that I wanted to look at. I predominantly liked the idea of the viewer having to use their own imaginations to perceive what is happening in the photographs, and used this as the basis of the definitive direction in which to turn my project to. During shoot 1 of this section, I directed my model in a dark eerie atmosphere to create the specific enigmatic affect I desired. I believe that the photographs which were slightly out of focus worked better to create this affect as it added a slight hint of mystery. I then went on to edit these photographs with images I had previously taken of an abandoned hospital. I hoped that this would add more ambiguity to the images. I believe these worked well but as I now knew the exact style I wanted to create, I knew I would be able to make it better. This time I thought carefully about what the model should look like and the type of environment she should be in. ...read more. I feel that from being given ?Journey? as a project I have learnt a lot along the way, inside and outside of the boundaries of photography as a subject. From doing a large amount of research on this topic I no longer view journey predominately as a physiological trip but instead, one that can be seen as a psychological journey. Perhaps most journeys are a combination of the two. One of my favourite quotes that sums this up is by Don Williams, American novelist and poet. ?The road of life twists and turns and no two directions are ever the same. Yet our lessons come from the journey, not the destination.? I like to think that through my new understanding of the title, this realisation can be clearly seen from the differences in the type of work I have created from the beginning to the end of my book. At the start of the project I focused more on capturing physical movement, a subject that I found fairly uninteresting. Though as I continued with my assignment and studied a variety of artists, I believe that the development in my understanding reflects on the way that I have developed my style of work. I think this to be true for I believe my work becomes more detailed, interesting and much more carefully constructed. As this was my first project in which the majority of it involved people and facial expressions, it was interesting to learn how to direct people so that I was able to construct the photograph as I visioned it in my head. This was difficult at first, but from taking reshoots, and thinking about how to improve my images, I was much more careful with composing my photographs. I took into consideration the position of my camera, the position of my model, the focus of the image, the facial expression my model held, and the amount of light in the room. Due to this I do believe I have created a successful response at an intermediate level. ...read more. But you could also be thinking to your self the policeman is so small in the ever-growing gloom of the ally way how is he going to protect me. But there is light coming from the background, a sign of hope something of which to hold onto. Karin Becker Ohrn says, '....documentary was thought of as having a goal beyond the production of a fine print. The photographers goal was to bring the attention of an audience to a subject of his or her work and in many cases pave the way for social change'. Using Old And Modern Buildings As An Inspiration For My Final Piece. It would be very likely to relate. The second thing to look out for is objectivity. This is whether the subject implied by the photo is a true representation of the events they show in the colour, tone and contrast used. For example, if the subject was something gritty and sad, black and white colouring would suit it bringing a true representation of the situation implied.